The main threats to biodiversity within the city are pollution (including dumping of rubbish), drainage of wetlands, habitat destruction and invasive alien species, which may become more important in the context of climate change, particularly in our waterways. By employing innovate and creative design in new developments, there doesn’t have to be a conflict between nature conservation and development. 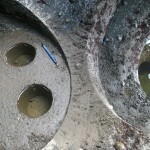 Dr Louise Firth from the Ryan Institute has designed a project in which the bottom of some of the defense structures on the Mutton Island causeway are filled in to create artificial rock pools to encourage more species to colonise. 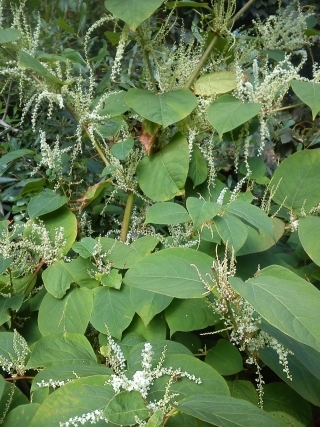 Japanese Knotweed (Fallopia japonica) is an alien invasive plant species native to East Asia, which has become successfully established throughout Ireland and much of Europe. It was introduced to Europe between 1825 and 1850 as an ornamental plant and was later used as a fodder crop for farm animals. Japanese Knotweed is a highly competitive weed. It grows extremely fast and a new plant can grow within a few days from only a small fraction of a root, stem or crown fragment. It grows faster than most native species and can grow in almost any environmental conditions. 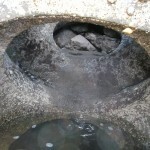 It has an extensive underground root system, which can withstand extremes in temperature. The main reason for its success is that none of its natural enemies, which keep it under control in its native habitat, exist here in Europe. Damage to infrastructure is a problem as it can grow through concrete and tarmac. It also damages ecosystems as it grows so fast it shades out all other species. 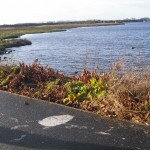 Effective control and eradication of Japanese knotweed is a difficult task, as it can grow from such a small fragment and these fragments are easily dispersed along watercourses and by animals. 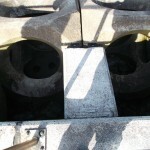 The most effective method of control is the direct injection and cut-and-pour system. A combination of herbicides are injected or poured directly into the stem during its flowering season. 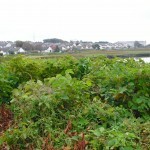 This treatment needs to be applied over 2 – 4 growing seasons and in some cases re-planting the area with native trees can restrict the spread of Japanese knotweed. 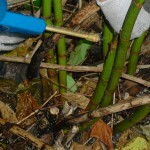 There are a number of sites in Galway infested with Japanese knotweed that are currently being managed by Radharc Landscaping using the Direct Injection & Cut-and-Pour method. DO NOT ATTEMPT TO REMOVE IT YOURSELF! Japanese knotweed is a serious threat nationwide and cutting or pulling of any kind contributes to its spread, which is against the law. For more information on Invasive Species check out the Inland Fisheries Ireland website. If you see what you think is Japanese knotweed, but you are not sure, please take a picture and send it to us.